Kamen Rider EX-AID's conflict is already getting out of hand isn't it? Well that's how things should before the conflict is resolved at the end of the series. What's predictable (or not) is that Masamune Dan (Kuroto Dan's father) is also a villain. So what's his role? He's the legendary Kamen Rider Cronus and I'm impressed by the darkness effects. He doesn't just show up for score but he shows everyone how badass he can get. 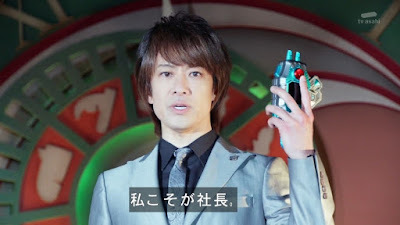 This new Kamen Rider has the power to control time. This reminds me of the late arrival of Kamen Rider Odin in Ryuki. As always, that series left a bad taste in my mouth no thanks to executives who forced in the reset button. Come on, I'd probably have liked Ryuki if everybody STAYED DEAD. Kamen Rider Odin showed time control. Hopefully, Cronos will be better written than Odin was. Odin was a cool concept but he wasn't well utilized in Ryuki. Odin just felt so empty and his identity was never revealed. After the temporary death of Dan Kuroto, it was fun to see Parad troll everyone around with his sadistic personality. Although it didn't look like Dan would come back but the new level of conflict is that Parad himself is actually the Bugster that possessed Hojo Emu to start with. Hojo's role as a host for Parad is pretty interesting. Even during Dan's "death" we see flashblacks that show how Kuroto got separated from his host. I usually prefer old school Super Sentai (depending on which era) while I like Kyuranger's new writing formula. I thought about new school Kamen Rider and why I don't even feel that generation gap. The Heisei era is pretty much a new era where Kamen Rider Kuuga is pretty much an ambitious "reboot" of the Kame Rider franchise. It redefined how Kamen Rider will be written. No more stupid villains who rant nonsense about how they'll take over the world with convoluted plots. Kamen Rider has become more of a J-Drama since Kuuga up to present. While the Showa era is honored but the new era is pretty much a redefined version of Kamen Rider. 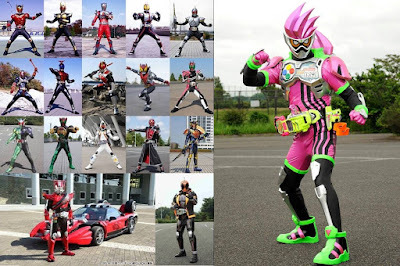 Not all Kamen Rider series are perfect and I admit that I still think Kamen Rider Decade was really a weak point in the Kamen Rider franchise but I admit that post-Decade series are still good in their own way.